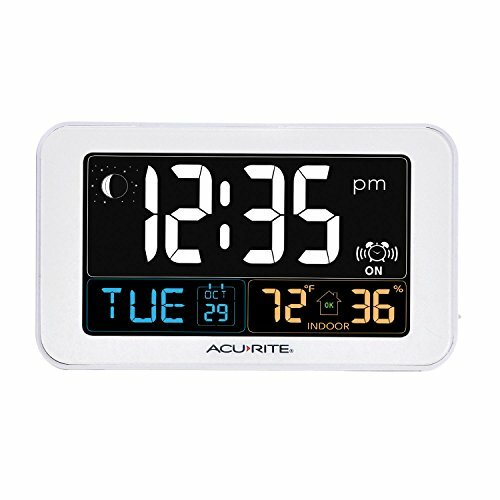 The AcuRite Intelli-Time alarm clock features an illuminated color display with indoor temperature (Fahrenheit or Celsius), indoor humidity, clock, date, day of week, moon phase and alarm. The integrated USB port charges compatible smartphones with 1.5 amps of power. The Clock's alarm gradually increases in volume over a two minute time span to WAKE you up on-time and peacefully. Featuring AcuRite's exclusive Intelli-Time technology, the clock comes pre-programmed with the correct time and date. 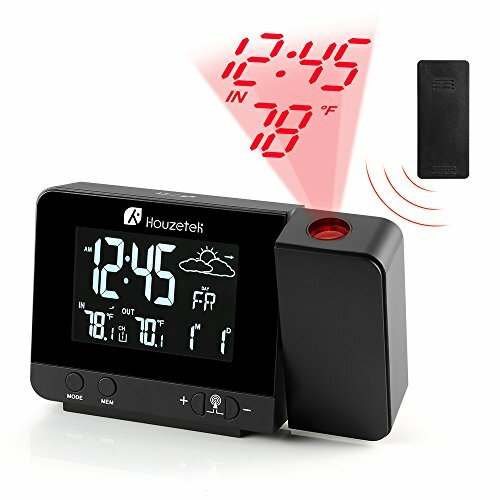 It automatically updates itself for daylight Saving time and maintains time and alarm clock settings, even in the event of a power outage. Includes time zone settings for pst, mst, cst, est, ast, hat, akt and ndt. Temperature and humidity can greatly affect quality of sleep. 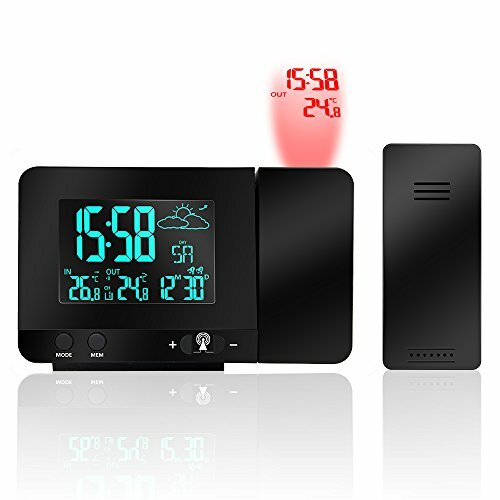 The clock displays the indoor temperature with a home comfort icon that easily indicates high, low or ideal humidity level conditions for your bedroom. The clock automatically adjusts itself for daylight Saving time (DST). one-year limited warranty. 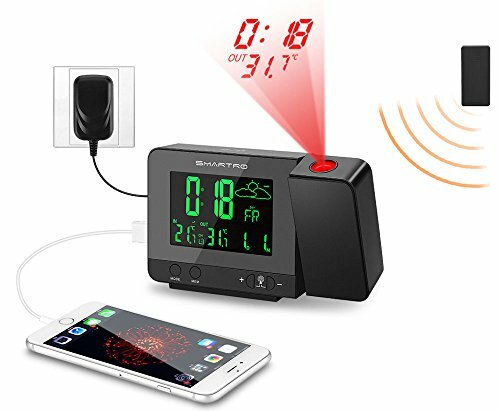 Atomic Wireless Weather Station with Indoor / Outdoor Wireless Sensor – TG645 Color Display Weather Station Alarm Clock With Temperature Alerts, Forecasting by Think Gizmos. 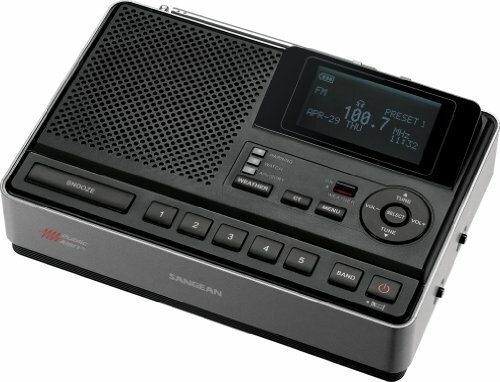 The new Weather Station clock with remote sensor now includes radio controlled time and date setting using the WWVB Frequency. 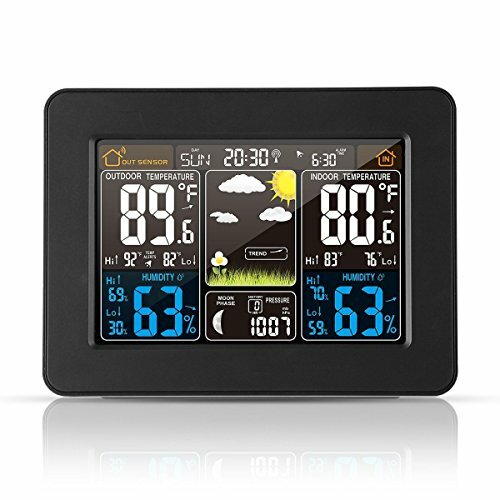 With a size of 6.5 Inches wide by 4.7 Inches high and a depth of 2 Inches, this weather station is a perfect size for looking great and showing all the details you require on the LED display. Having the remote sensor setup outside will send back data to the main home weather station which using its own data readings and readings from the sensor will give you the weather outlook for the next 8 hours so you can plan accordingly without having to step foot outside. The wireless weather station then displays this data on the stunning color display with clear icons. Included in the box is a mains power adaptor so all that is needed is 2x AAA batteries for the sensor to be all setup. 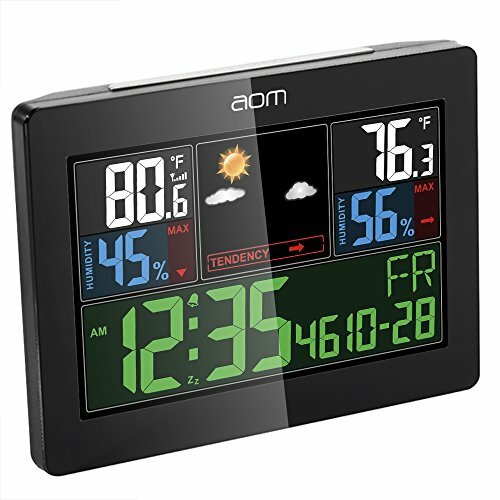 The atomic weather station also now includes a backlight button which adjusts the brightness to your requirements. Although we recommend the main unit is powered by the included mains adapter, it can also be powered by 2 x AA batteries if you desire (not included). 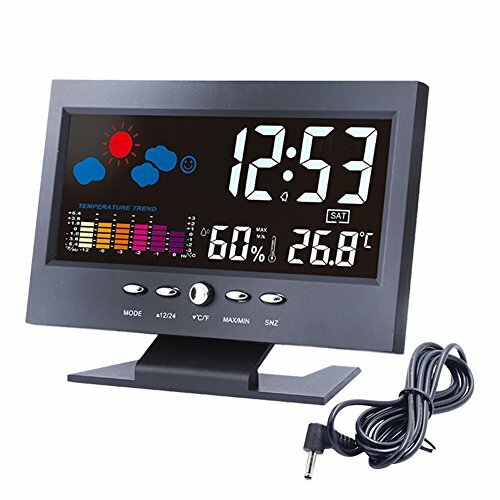 Reliable Wireless Weather Station Indoor Outdoor model that will look stunning in any home or office environment. This item is a ThinkGizmos branded product. ThinkGizmos is a registered USA trade mark. Project the radio controlled time and indoor temperature on the ceiling or wall. The ClearView Projection Clock includes a focus adjustment dial for a crystal clear projection. 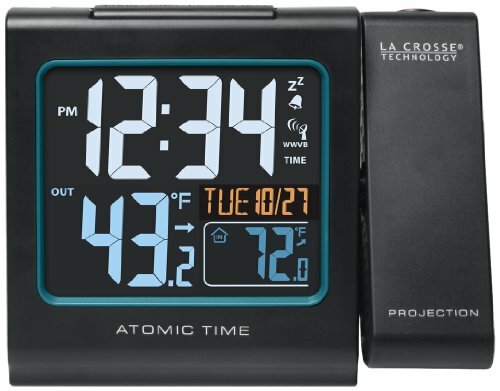 In addition, the projection can be reversed 180 degrees for optimal viewing throughout the room.The alarm clock features a bright backlit screen with time, month / date, day of week and indoor temperature, an alarm clock and snooze button.Equipped with an atomic clock, time is set automatically via radio and in synch with the U.S. atomic clock for utmost accuracy and automatically sets adjusts for daylight savings time.Does not support Alaska and Hawaii Time Zones. 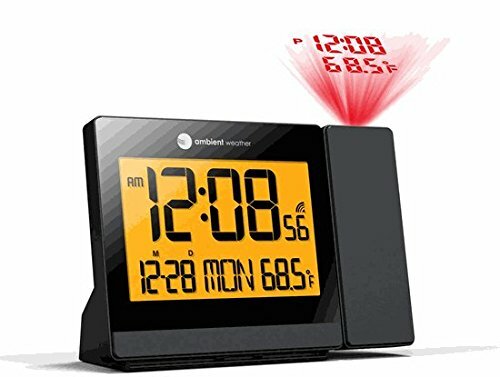 Compare prices on Alarm Clocks With Weather at ShoppinGent.com – use promo codes and coupons for best offers and deals. Start smart buying with ShoppinGent.com right now and choose your golden price on every purchase.